Making predictions about the future isn’t easy in any industry, but it’s even tougher given the economic downturn of the last year. In 2008, I predicted that the economy presented more of an opportunity for our industry than a problem. Looking back at all three of our shows in 2009 (Streaming Media East, Streaming Media Europe, and Streaming Media West) we saw record attendance, and I don’t think there are too many shows that can say the same. The point isn’t that I’m such a fabulous prognosticator; it’s that online video is on everyone’s mind now. It’s no longer, "Oh yeah, we should do that too," but rather "Let's get it done...now." Why ? Well, I could go on and on, but I'd much rather introduce to you the thought leaders of our industry in this special annual section, Executive Predictions. Jeremy Allaire, Founder, Chairman, CEO, Brightcove Inc.
2010 will be another exciting year for online video. Consumer demand for high-quality online video across desktops and devices has sparked a number of industry trends that will crystallize in the New Year. Organizations and businesses from nearly every sector of industry and society have made online video a central part of the marketing mix. With this proliferation comes a complex set of requirements for publishing, delivery and distribution. In response to this trend, Online Video Platforms, or "OVPs," will become an increasingly common addition to the suite of software and services website publishers rely on day-to-day. In 2010, OVPs will become even more sophisticated, open, and extensible, spawning further growth of the global ecosystem of technologies and services that interface with this fast-growing industry sector, adding value and generating business opportunities for partners, OVP vendors and customers. In the midst of the broad, horizontal adoption of online video which is changing the way businesses and organizations communicate, we will also see a raft of changes in the media industry, most notably the widespread adoption of blended monetization strategies. Media businesses will roll out a number of initiatives in 2010 that augment ad-supported content with premium access to online video based on subscriptions, micro-payments and community membership. In the television broadcast space, programmers will experiment with TV Everywhere initiatives, while at the same time bolstering direct-to-consumer online video offerings that offer direct control over advertising, brand experiences, and fan communities. Lastly, connected televisions and smart phone devices will make significant strides in the quest to give consumers access to video content available on the open Internet. While still lacking an open industry standard that gives consumers true portability for online video across three screens, the new generation of devices promises to fuel further demand for online video and growth for the industry. Prediction 1: The recognition of scale. People will recognize the real magnitude of video: the pervasive, ubiquitous use of video for business. Think about this, Cisco believes that pervasive video will drive their growth from $40B to $100B. That’s $60B worth of scale! Prediction 2: Market structure asymmetry. Content owners make money and good margins, content producers don’t, the OVPs do, the CDNs don’t, and the infrastructure players do. These asymmetries will be the drivers behind dramatic changes in business models in 2010 and 2011. Prediction 3: Consolidation shall commence. There are too many CDNs and too many OVPs. Every new industry sees too many entrants with insufficient differentiation. The game of musical chairs will begin. Aspirational 1: Benefits, not features. I hope people do a better job at explaining the beneficial use of video. Let us move beyond the speeds and feeds discussions and move towards much richer contextual discussions. Aspirational 2: Video becomes center. I hope the advent of HMTL5 and other forms of rich media will help push video to center stage. Video will no longer be simply embedded into HTML, but HTML will be placed inside video. Creating video to be powerful mini sales kiosks. Aspirational 3: The marketer’s dream: I am being heard. I hope marketers everywhere will begin to use advanced, immersive video analytics to determine the effectiveness of video as a powerful communication medium. Many analysts have questioned when exactly is streaming in the corporate and academic enterprise going to cross the chasm. 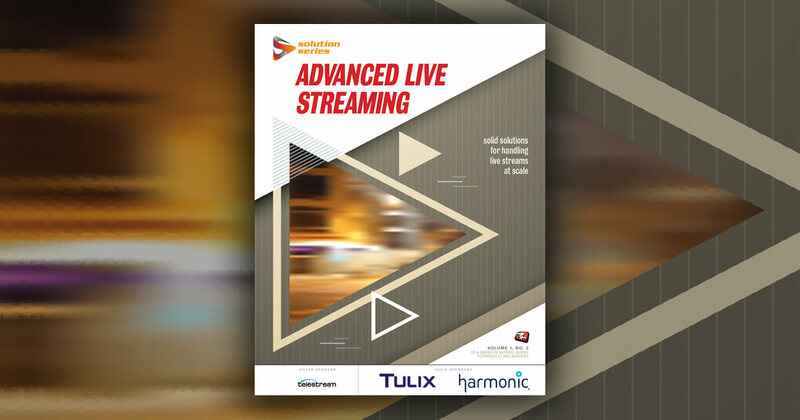 Aside from the explosion of rich media for entertainment, we’ve felt for the last couple years that webcasting, lecture capture and hybrid events remain in mid-leap between the early adopters, enthusiasts and visionaries and the pragmatic early majority. Why? Perhaps the market has needed this time to mature, but I’d also argue the economic challenges of today have been productive in building an even more solid base for streaming as a foundation for improved communications. Coupled with this increased awareness is growing recognition of the value of streaming for many aspects of learning and training in both the corporate and education markets. • Attending virtual conferences while avoiding the hassles	and economics of travel? • Taking education to students and employees in new ways; making it possible for adult and returning students to further their education while working, giving students the flexibility to watch class (or watch again) and creating a larger stage for faculty to share knowledge they impart in the classroom each day? • Getting all the employees on the same page at the same time; removing the need to even leave their desks, keeping productivity up and company objectives aligned? For reasons like these, we’ve never been more optimistic about what the future holds. And never more dedicated to creating the easiest to use, most-reliable and best-supported webcasting platform on the market. Several key trends are shaping the future of the live streaming market. While the number of streaming distribution outlets, web viewers and video content itself are all going up, the cost to produce high-quality live streaming content is going down. Lessons learned from traditional TV broadcasting and post-production are helping us develop products that make sense for today’s broader web and mobile markets. It’s now possible to create webcasts with the high production value of television broadcasts using software products running on standard computer platforms for a fraction of the cost of traditional hardware systems. These software tools control real-time switching between multiple live video cameras and include features such as chroma key, 3D graphics, built-in titles, video overlays, branding and lower-thirds – all for only hundreds, instead of thousands, of dollars. These tools are enormously empowering and easy for anyone to use. A single corporate communicator or streaming media producer can now wear all the hats, control all the functions, and replace the need for traditional broadcast technical and production crews. Telestream has a long history of innovation in on-demand file-based workflows. Now, our Wirecast products have allowed us to enter the live stream-based market. We look forward to expanding our live video production solutions to serve the growing number of broadcasters, corporations, universities and houses of worship who need to quickly and affordably broadcast live events, lectures, services, and town hall meetings to web, mobile and TV audiences. Two years ago, we predicted that the webcasting and online video industry was about to go primetime. Then last year, the recession smashed open the streaming media floodgates and every major company jumped in all at once. Some swam while others sank. This year, we can keep them all afloat. In 2010, it’s about fine-tuning – broadband infrastructure is in place, our software can deliver the goods – innovative video projects are waiting to be launched. We can blow’em right out of the water if we do it right. At Stream57, we don’t have to convince anyone that they need this technology anymore; webcasting is now a must for every company. We now build solutions to meet the specific needs of each client – we are the experts in reaching the audience they need to reach, and we can help them do it in the best possible ways. Last year I stated, "We’re already a necessity, and most of our market doesn’t even know it yet." Well, to be honest, this industry took off running as soon as it had legs to stand on. And our role has changed pretty drastically since just last year. We all once feared slow connections, subpar production, even clients that didn’t "get it." These aren’t really obstacles anymore. In fact, they’re more or less gone completely. We’ve always prided ourselves on offering nothing but the best quality technology. Now it’s time to show’em what this stuff can really do. In 2010, expect the business of professionally produced online video (and those services enabling it) to expand dramatically. We will see accelerating use of video by businesses of all sizes to more effectively market and showcase their goods and services; communicate who they are in the marketplace; interact with customers and prospective customers; and ultimately grow their revenues and monetize their business. In other words, businesses will increasingly use video to drive their overall success. ... So long as that video is done right. "Right" in this context means high video quality and overall process simplicity, in addition to the actual video content itself. This will increasingly separate the winners and losers in the video-enabling world in 2010. Those who enable services that make it easy to publish the highest quality video over the Internet will realize this online video market opportunity. Quality is absolutely essential, because quality is credibility. Video quality reflects on the business’ products, services, and overall brand. From content providers to solutions vendors, companies in the streaming media space have weathered the global economic storm far better as a whole than many of our counterparts in ‘traditional’ industries. Many even thrived, as both audiences and advertisers increasingly turned online in 2009, and industrial and institutional users realized the benefits of streaming media for cost-effective, higher-impact internal and external communication. As the economic gloom gives way to recovery, attention among content owners and online destinations is again turning from ‘monetization for survival’ to ‘strategic monetization for sustainable growth’. Rights owners and content portals are working more closely together than ever, and finding new ways to connect content to opportunity by using existing technology foundations in new ways. Content identification technologies such as fingerprinting and watermarking, often thought of only for protection against unauthorized use, are enabling new monetization opportunities. Automatic recognition of ownership of uploaded clips on sites such as YouTube gives owners the option of allowing advertising to be run against the content rather than blocking it, letting them capitalize on additional revenue opportunities by leveraging the content’s grassroots popularity. Meanwhile, the latest adaptive bit rate delivery (‘adaptive streaming’) technologies bring Web viewing experiences far closer to the quality and reliability expectations of ‘traditional’ television while wrapping them with rich interactive capabilities. We are closer than ever to a true, online television experience. By increasing viewer engagement and lengthening average viewing times, these technologies enable increased opportunities for advertising impressions, which directly translates to monetization potential. The strength of the streaming media ‘industry’ through the economic crisis is a sign of how far we’ve all come in the past decade, and our community is even better positioned as we enter the next.